I was walking with my daughter after the class and was pondering whether my Grandmothers might have used this machine. The night was so pretty and though cold (mid 50's) I was enjoying the flowers. We were finding them in the most unusual places along the trail we walk and I was reminded of my Mom and how a few years back she had decided to go in search of her Grandmother's house. She had a great many memories of spending summers on the farm and hadn't been there in many years. 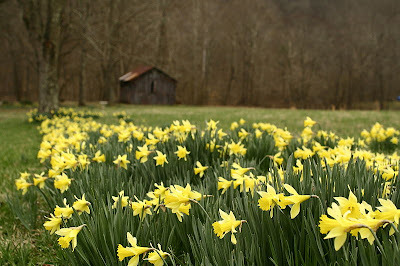 When she got there, the house had been taken down and nothing remained but the daffodils that used to line the driveway. There they were, all lined up in the field. I thought this would make her sad, but she was actually comforted by the memories of those flowers and finding them was like finding a piece of her Grandma. When we got home I started looking for photos of my great Grandmother, but couldn't locate any. What I was able to find is this picture of my Grandmother, my Dad's Mom. 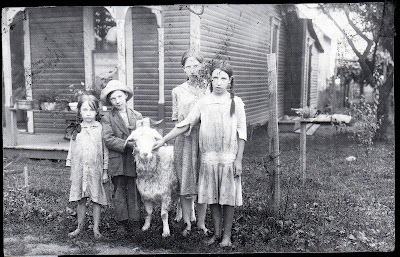 She is the little one on the left with the bows in her hair. 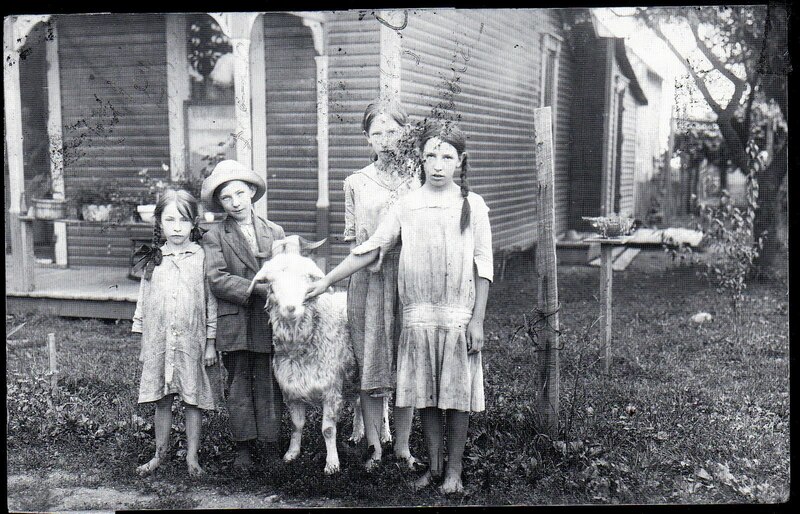 It was confirmed again that I should be a farm girl as my family were farmers. I'm so amused by this picture. They are covered in mud and barefoot. Did this rascal of an animal get loose? I would love to know the story. I'd also like to know if there is a Featherweight sewing machine behind that door. I forgot, I'm having a give away for the first time. Come check it out! I have one that looks just like that except it has a cabinet that it lays down in. 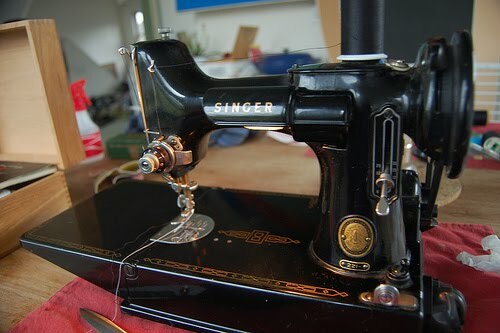 It's made around 1939 and according to the lady that serviced it, mine is a 3/4 not a featherweight. It is really heavy but it sews beautifully. What a sweet story. It tugs at my own heart, in my early 30's I looked for the house where I lived when my mom was still living. The owners even answered the door when I knocked and let me in. I had the strangest of feelings when I walked through the rooms that I only saw in photos. It was a huge comfort. There are 4 older ladies in my quilt club who own the featherweights and carry them to class each month. They love them and have had them for many years. My husband serviced 2 for them (as a favor) and found it easy to reach the parts for cleaning. I also own a Featherweight- I sew on it lots and it is so nice to take to classes. My DH gave it to me for an anniversary gift several years ago. PS Grandma was a cutie! I'm so happy your class went well. I don't own a featherweight, but many of the ladies I used to teach quilting to had them. You got good info about them. Depending on the price, you can't go wrong with one. Loved your family picture. I have a lot of my Mom's family and wish I had written more about what my Granddad told me about them. Have fun finishing your bag. 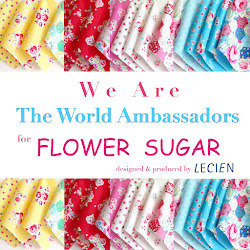 Can't wait to see it and the fabrics you chose. My cousin was given a Featherweight, and she takes it to retreats as it is easier to lug around. It sews like a dream, and she loves it. I haven't met a person who regretted buying a used Featherweight. Hope this helps. Love the picture of the children!! Now that's what I call a black beauty! Wishing you a happy Wednesday, Renee!! I love this touching story about your mom (& grandmother), very sweet!